Every now and then, on rare occasions, it’s always good to check in and see what Mom is doing on her cell phone. Mom, being in her 70s, isn’t the usual mobile user, so when she does something different it catches my eye. This summer, Mom complained vehemently about the iPhone, saying that it was too expensive, and who wanted to check their email and surf the Web on a small phone. (It was easier not to argue.) Anyway, Mom did say in passing that the only thing she used the mobile Web for was to check sports scores. Since then, I’ve noticed more and more people using their cell phones to check schedules and sports scores, review standings, and look up statistics, even when a Internet-connected computer is at arm’s length. 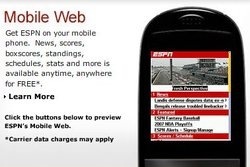 AdvertisingAge noticed this, too, as it just reported that this season three times more football fans hit ESPN’s mobile site than it did its PC pages. While ESPN declined to give AdvertisingAge specific numbers, an executive briefed on the data said that one 24-hour period registered 4.9 million visits, while the PC section at ESPN.com hit 4.5 million. And it points to the the future of mobile devices. Cell phones are no longer for voice. Up until the iPhone, mobile devices have had slow, kludgy access to the mobile Web and, for the most part, it’s been a horrible experience for users. BlackBerries and smartphones using Windows Mobile, Symbian, or Linux-based operating systems have been marginally better, but there’s loads of room for improvement. That improvement began with the introduction of the iPhone and the use of a real Web browser (a scaled-down Safari) and is bound to continue as Google’s mobile operating system Android, Yahoo’s open mobile widget platform, third-party developers, and handset manufacturers (not to mention the carriers) get their acts together and offer solutions and easy access to the information people want — like sports scores and fantasy-football statistics. I think Mom is on to something. I think this is a great article and we expect to see much more to come in this field. As mobispine is a smart mobile news reader we also see lots of people using mobispine to read news about Sports from their mobile phone. http://www.bywifi.com is a great mobile website. It provides mobile transcoding of videos and web pages for mobile phone and PDA. Could it just be a few users reshreshing the heck out of a single page hoping their team scores another? @shen: i agree with you. that’s what i first thought. but i think it’s unique visitors. even so, that’s what users do on the desktop anyway. i’m always refreshing to get the updated baseball playoff scores. it’s the same with mobile.